Miami Geo Quiz #31: The Sentinel. Source: Matthew Toro. July 12, 2015. Miami Geo Quiz #31: From what vantage does this Miami Sentinel guard our city? Double points if you provide the name of the piece. Triple points if you include the statue’s place and date of origin too. Ingrid E. Argueta, Carolina, and Osvaldo Musalam all get single points for getting the location right! Osvaldo Musalam was even more specific on the location — nice, single points for you three! However, 2.5 points go to Carolina for going all the way with the name of the piece — “El Centinela Del Rio” (The River Sentinel) — and name of its artist (Manuel Carbonell). According to this piece’s plaque, it originated in Pietrasanta, Italy, at the Fonderia Artistica Versiliese (Versiliese Artistic Foundry). That would have been three points. Good job, everybody! Thanks for playing the admittedly nerdy, but undeniably fun Miami Geo Quiz! The next one is coming soon! Brickell Avenue Bridge, Tequesta family, Cuban Master Sculptor Manuel Carbonell in 1995. The “Pillar of History” . 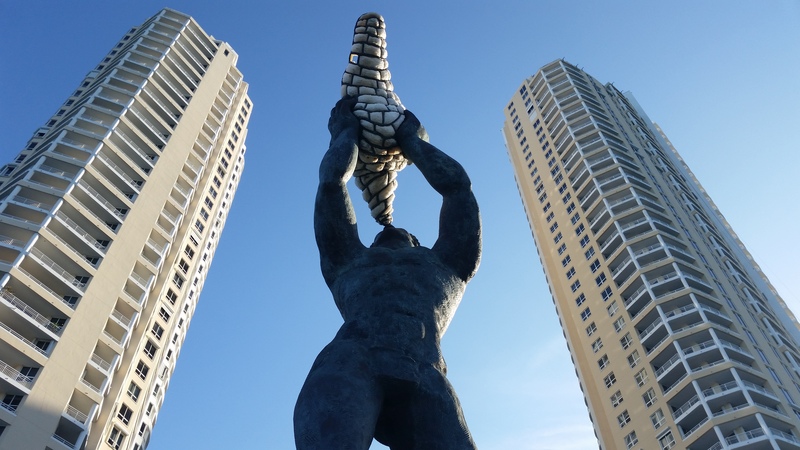 Sculpture was created by Cuban-born sculptor Manuel Carbonell and unveiled in July 1999. Located in Brickell Key, Miami, FL.